Having a secure, replicated backup that can be recovered quickly or even a live replicated infrastructure to keep downtime to hours and not days is essential. Most businesses cannot function without IT services these days and making these services available may also make the difference. Relying on the Cloud for disaster recovery has become a realistic method of achieving a business continuity strategy to modernise your disaster recovery strategy. How would you gain access to your data? What services are the most important to you as a business? What services would you need first? These are all simple, yet very important questions that will help you determine which services to prioritise as part of your disaster recovery service. Trustmarque designs highly available systems that cope with all disaster and operational failure scenarios. We can review your existing architecture and process; and redesign and build new solutions to ensure you can meet your strategic objectives without operational risk. To deliver the most effective and relevant disaster recovery and back up services possible, we’ve combined our expertise in the latest cloud, infrastructure and application technology with our enterprise IT experience of more than 20 years. We know what it takes to deliver successful disaster recovery and business continuity solutions, having been responsible for both public and private sector organisations’ core infrastructure; and building a range of disaster recovery solutions across our own and other companies’ data centres. Backing up and recovering data is a necessary discipline in all organisations. Most data loss instances are caused by operational failures such as power, hardware and software failures and human error. The consequences of data loss are well documented and losing your data could prevent your organisation from trading. The importance of resilient technology is understated when it comes to your data, maintaining systems that cannot meet your policies, requirements and timeframes represents a significant risk to your business. At Trustmarque we provide a simple and reliable cloud integrated Backup solution contributing to business continuity and disaster recovery, a solution that protects your data and your applications on your on-premises servers and virtual machines. The service has been designed using enterprise class technology. Powered by Microsoft Azure Backup, the security levels provided by a worldwide network of Microsoft managed data centres ensures your information is in safe hands. End-to-end service levels with SLA’s for backup and the responsiveness of 24x7x365 support and monitoring from Trustmarque’s service team combine to deliver peace of mind that your data remains secure. 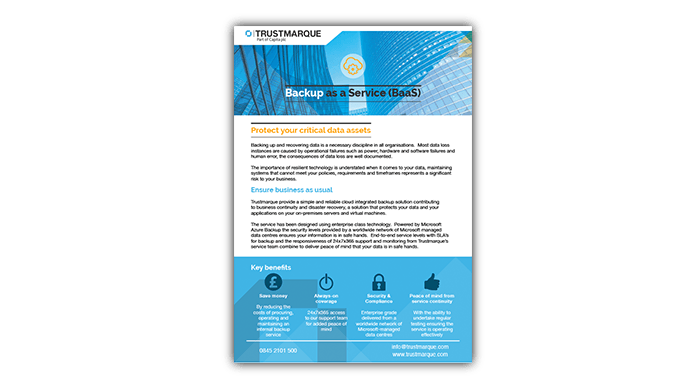 What are the benefits of Trustmarque’s Back up as a service (BaaS)? Unexpected disruptions can have far reaching effects on an organisation; the impact on your service levels can leave you unable to meet your users’ needs, and service outages can render you non-compliant with industry or government regulations. With our Disaster Recovery as a Service (DRaaS), we remove the complexity and cost of procuring, operating and maintaining a secondary datacentre. Using the power of cloud, we’ve designed our services to scale on-demand, from providing Disaster Recovery for an individual project or facility to the whole of an enterprise. This means our Disaster Recovery is ‘as a Service’, enabling you to re-focus on your core business and consume only what you need. Our Disaster Recovery as a Service (DRaaS) is a public cloud-based managed disaster recovery service, based on Microsoft’s Azure Site Recovery capability. It provides a cost-effective, automated disaster recovery solution for protecting all of your applications and data, while reducing the risk of downtime posed by unforeseen conditions. 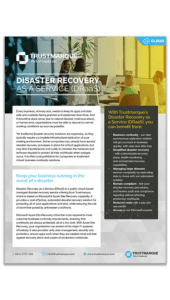 What are the benefits of Trustmarque’s Disaster Recovery as a Service (DRAAS)?